Join us for an evening of music in the planetarium! 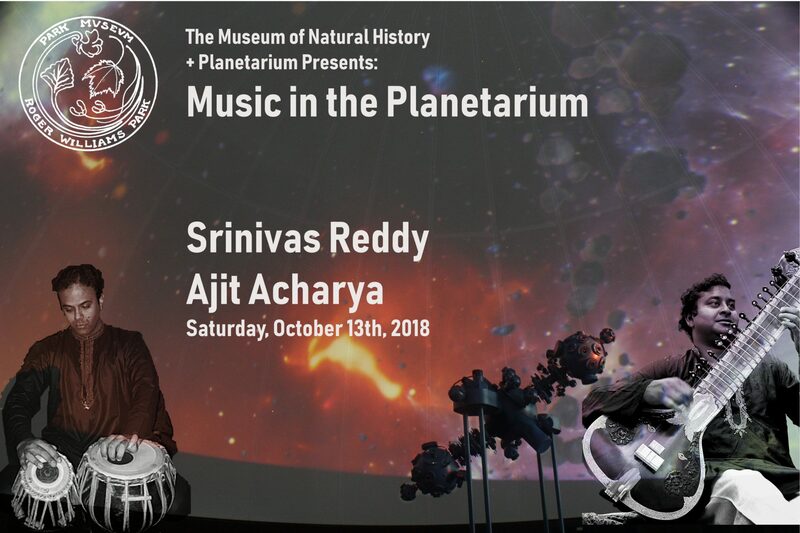 This concert will feature Srinivas Reddy and Ajit Acharya performing sitar and tabla in the North Indian classical tradition, a musical practice deeply rooted in the close observation of the natural world. There will be two 30-minute performances, one at 6:00 PM and one at 7:00 PM, with a short Q+A after each performance. Doors to the museum open at 5:30 PM. Price is $3 per person and includes museum admission. Early arrival is suggested as tickets will be sold first-come, first-served on the evening of the performances. Children under age 4 are not permitted in the planetarium. New England-based tabla player Ajit Acharya began his training under the tutelage of Sri Sheshagiri Rao of Bangalore, India. He also studied extensively with Dr. Rajan Sachdeva, one of the most respected and prolific Indian music teachers in the midwest. His tabla apprenticeship continues under the guidance of Pandit Samar Saha of the Benares gharana (or style) of tabla. Ajit has accompanied instrumentalists, vocalists and dancers. He has also given workshops all over the country and performed extensively with fusion, jazz and experimental musicians.